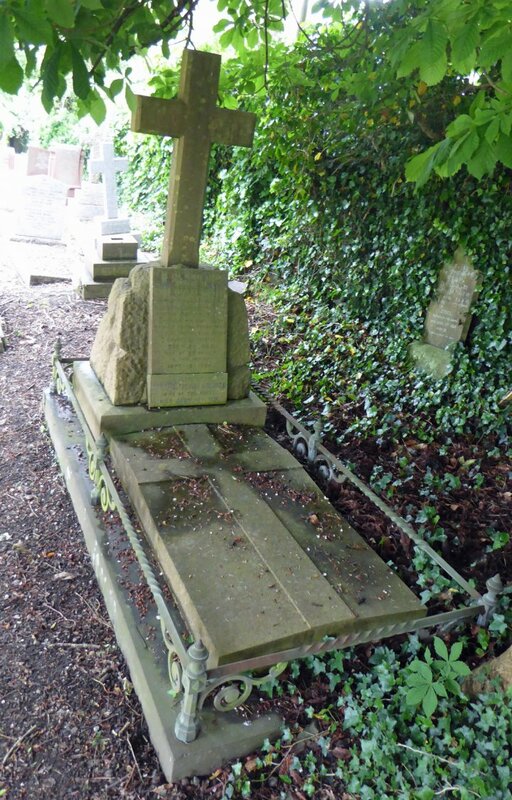 This is the grave of Colonel Hugh Robert Hibbert and his wife Sarah Catherine Augusta Hibbert. Hugh Hibbert was born at Birtles Hall in the County of Cheshire in 1822. Sarah Hibbert (neé Lee) was born in 1840, daughter of the eminent artist Frederick Richard Lee of Broadgate House, Bellaire, Pilton. She married Hugh Hibbert in 1861 and they lived first at Birtles Hall in Cheshire, probably until about 1880. Then just after the death of Frederick Lee in 1879, they moved to live at Broadgate House, Pilton. Hugh Hibbert was Colonel of Her Majesty’s 7th Royal Fusiliers and served throughout the Crimean War (1853-56). He was severely wounded in the assault on the Redan in 1855 and eventually retired in 1878. He died in Pilton in September 1895. After his death, Sarah was eventually forced to move to a cottage within the grounds of Broadgate House after settling the debts of a wayward son. She died in January 1931. Their grave can be seen close to the NE wall of Pilton Churchyard. Hugh and Sarah were the grandparents of Ida Loetitia Williamson, the wife of ‘Tarka the Otter’ author Henry Williamson. Thanks to the Friends of Manning's Pit for drawing this grave to our attention.